Are organized in your office? Do you need a way to make your life easier in the church office? If yes, then take a moment to download the calendars below that will help you keep track of church birthdays, events, anniversaries, phone calls, weekly assignments and much more. All of these great calendars below are awesome tools for you to use in your church office to help you in so many ways such as tracking birthdays, anniversaries, events, and the list goes on and on. The PDF version you can download below and it can be converted to the original format to customize these calendars or you can purchase the Church Forms CD at a very reasonable price that includes all of the forms on FreeChurchForms.com in 2 formats (PDF & MS Word), a few in other formats such as MS Excel (for calculating purposes) and MS Publisher but not many of them. 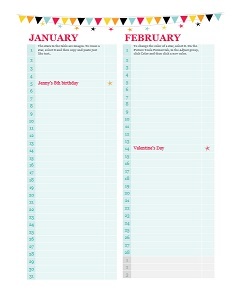 The Birthday/Anniversary tracker (free calendar template) was created in Microsoft Office Word and it includes 2 months per page beginning with January and February with the dates lined up to insert birth dates and anniversary dates of your church members...and goes all the way through December. The Weekly Appointment Calendar was also created in Microsoft Office Word and includes every day of the week with time slots every hour from 8:00 to 5:00 with two columns to insert name and number. On the top of the calendar you just insert the date of the first day of the week. This calendar will definitely be an asset to help you to not miss that very important phone call, etc. The Weekly Assignments Calendar was also created in Microsoft Office Word and includes name, month, and year. You simply insert your dates for Monday, Tuesday, Wednesday, Thursday and Friday and then insert your subjects and then just fill in your assignments under those days/dates. Return to New Years Activities from the Free Printable Calendars.